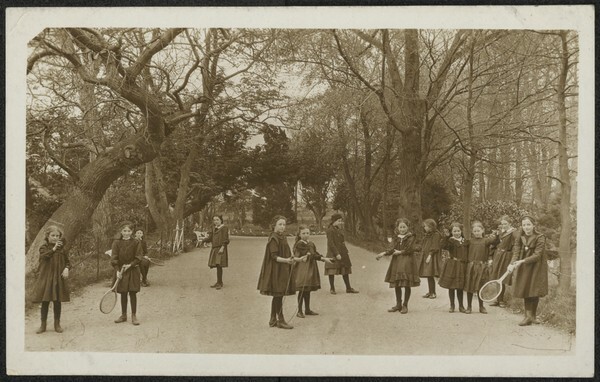 Abstract: Postcard sized photograph of young boarders in school uniforms, holding tennis racquets. On the verso of the photograph is written 'Loreto Archive, pupils Loreto Abbey, Rathfarnham'. The photograph is undated but probably dates from the early 20th century. Young boarders, Loreto Abbey, Rathfarnham, Dublin is licensed under a Creative Commons Attribution-NonCommercial-NoDerivatives 4.0 International License.